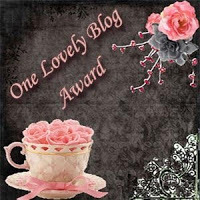 I am so excited to be given the One Lovely Blog Award from the equally lovely Patrice at Whimsically Yours (Her blog is AMAZING – check it out :)). This is how the award works! You thank the person who gave the award to you by linking back to their blog. You list seven TRUE things about yourself and give the award to seven others! 7 true things about me! I am so addicted to Coca-Cola! The full fat stuff – I hate the taste of diet!! In fact I have to limit myself to one can a week now because otherwise I will drink and drink until my teeth fall out! On the subject of teeth, I have had braces for 7 years!!! Yes, you heard me – 7! I had them on when I was thirteen, got them off when I was 17 my teeth moved again (damn you teeth!) and I had to have them back on! I’m 20 in April and they are coming off in Feb!! Thank goodness – because everyone thinks I look about fifteen with them on! I have four cats, a dog, 3 guinea pigs and five African land snails! Its basically like a zoo at my house! My Grandpa has met the Queen, Princess Anne and was meant to meet Camilla Parker Bowles but got the wrong day!! I’m terrified of flying in aeroplanes! But I am desperate to visit the USA so I will have to get over my fear one day!! My new years resolution this year was to raise money for charity, so this July me, my dad and my brother are cycling from London to Cambridge (60 miles) in aid of breast cancer. Previous Post Top Ten Tuesday! Next Post 5 book to movie adaptions that I CAN’T wait for! Thank you for the award! I love to read these facts about people. It’s great that you want to be a lit agent! Thanks for the nomination! Unfortunately, I’m an award-free blog (I guess I should put that somewhere), so I won’t be able to continue the chain.